This Time Tomorrow: who's bad? Before you all giggle and call me out for sporting these gloves that I likely didn't wear all day (too hard to type with), let me explain. Originally, as I was 10 minutes ahead of schedule this morning (a first!) I decided that I needed to spruce up my leather skirt and silk combo. After harboring a secret admiration for how the lovely Liz over at Late Afternoon wore her cut-off biker gloves just a few weeks ago, I decided, why the f- not? I mean, you never know when you might have to jump on a Harley with a guy named Hell's Doorman. Really, you never know. On top of that, the annual motorcycle festival, Street Vibrations is going on here in town. That means thousands of bikers from all over the country cruising the streets and generally causing the windows here at work to vibrate throughout the day. Might as well pay some homage, right? P.S. I'm in search of the perfect pair of platform pumps like these only not by YSL because, quite frankly, I'd have to sell a kidney for that. Any suggestions?! this outfit literally belongs in a magazine! and youre right, who cares if you didnt wear them all day, they look fabulous regardless! p.s. I really like the shirt! Your blouse is so chic. And those biker gloves are the perfect thing to rough them up! Really hot gloves! No laughing over here. Love the leather skirt! I just bought a thrifted (originally from BR) a-line one (not quite as badass) that I plan on subtly including in my corporate office wardrobe sort of just to see if anyone says anything about the fact that I'm wearing leather! You can live without a kidney, but can you live without those shoes? LOL Gorgeous!! Aldo has similar shoes to that for around 135 ish. I really like how the sunglasses work with the rest of the outfit. Where are they from? love the gloves! i've been looking at biker gloves for a while now too. for pumps like that--i've seen something kinda similar at charlotte russe. good luck tracking them down! Love the outfit! Fab gloves! Wow that blouse is perfect! Love the whole look, you look beautiful girl. i love the skirt, great combination with the blouse! oh i adore your shirt, so super pretty! You look great! 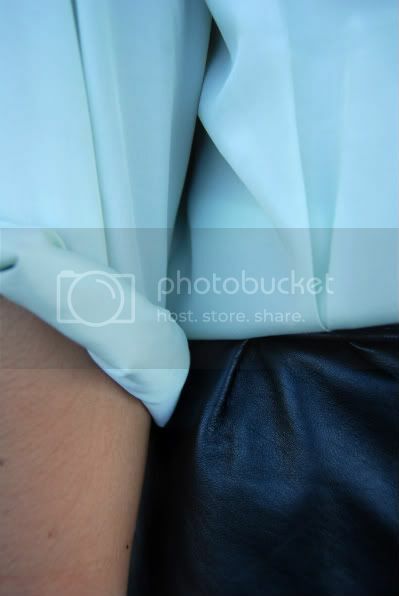 Love the combination of silk and leather!! Loveeeee! So all your outfits have been amazing! I am so toally in love right now! Just thought I'd say it here before I go crazy commenting on everything lol. amazing. the blouse and skirt are perfect together! And, your outfit rocks. So glad I found your blog! you look amazing in that outfit !